2017.September.13 from 7pm for 55 minutes of fun at the CP Arena Upper Hall. Zumba instructors Louise, Trina Kiki and Val are bringing non-stop energy for this cause. A fun class - no experience required. Doors open at 6:30 pm for waiver signing as well as for registration/payment for our new ZumbaFunFit fall program. A minimum of a toonie donation is much apreciated. 2017.April.5 from 7pm to 8pm CP Arena Upper Hall. Multi-instructor free class to support LCIH. ZumbaFunFit is hosting a Zumbathon for the Fort McMurray residents that suffered a devasting fire in their city. ZumbaFunFit's Fall 2015 session opened with a special fund-raiser to support cancer research. ZumbaFunFit's Fall Cancer Fund Raiser was held September 9th at 7 pm in the Upper Hall of the Carleton Place Arena. This year I was touched by the story in our local area about Jillian who is a young woman and neighbour with incurable breast cancer. So I thought I would like to allocate our fund raiser this year in a very specific way. After talking to Jillian's family the Biopsy Gun for the Ottawa Breast Health Centre was selected. The funds raised in our Zumba class on Sept. 9th will be donated to purchase this equipment. I encourage you to read on about the background to Jillian. When Jillian O’Connor peers into the future she sees possibilities: days of laughter and play with her three young children, family trips, holiday memories. A year after being diagnosed with incurable breast cancer while pregnant, O’Connor says she is too busy living each day with her children — including six-month-old Declan, born after his mother underwent chemotherapy — to think about cancer. Her optimism in the face of a devastating diagnosis has touched many people who have sent her well wishes and offers of help. Similar to a needle, but larger in size and more complex than a syringe, a biopsy Gun is used to remove breast tissue samples. The Ottawa Breast Health Centre needs 10 Biopsy Guns. Cheques in envelopes are payable to "The Ottawa Hospital Foundation". Upon request receipts will be issued for any donation over $15.00. Please send our flyer to a friend. This is a long, cold winter. But, before we know we’ll be breaking out the shorts and capris for summer. So join me as I prepare for summer. You’ve heard me talk about it in class so here is the official introduction of our Twelve Weeks Challenge. This year we are doing a twelve week program rather than 8 weeks we did in previous years.. The Free Challenge is a group open to all ZumbaFunFit participants who want to set a goal, conquer it, and win ZumbaFunFit Rewards for it! Whether your goal is weight loss or simply improving your overall health, join this group for free and reap the benefits of a social Zumba support network, along with motivational messages, and tips of the week. Most us need a little boost to get over the winter blahs. Now you can do it with your buddies at ZumbaFunFit and have their support along the way. Throughout the program points are awarded based on the number of Zumba classes you attend, and any other cardiovascular or weight training fitness activities you participate in on your own. Top winners from several categories will be based on total points accumulated. There will also be random draws for Zumba prizes from the participant pool throughout the challenge. You will find a full explanation about the point system and other details in our Challenge Guide. 1. Email me to tell me you’re participating. If you prefer you can sign up in class. 2. Set a goal for the whole period - let me know if you wish we will keep it private! 3. Weigh and/or, take measurements (for yourself only) - optional, and take a before photo if you dare! 4. Start recording your points as you go along (we will send the GUIDE only to those who sign up). Send your points each week to me via email. If you do not have email then give them to me or Tom each Monday or Wednesday class for the previous week. Check in on Facebook to connect with other ZumbaAddicts (our official Facebook page is on the ZumbaFunFit website link). You have to Choose LIKE to join ZumbaFunFit Facebook page. I hope you’re all as excited as I am to tackle the next twelve weeks! I have my fitness and weight loss goals set, have you? ZumbaFunFit's Fall session opened with a fund-raiser to support cancer research. This party was on Wednesday September 17th, 2014 at 7pm in the Carleton Place Arena upper hall. This was a blast for all those who came out in support of a good cause. ZumbaFunFit's Fall session opened with a fund-raiser to support cancer research. This party was on Monday January 6th, 2014 at 7pm in the Carleton Place Arena upper hall. This event showcased a new guest instructor: Kiki. Louise, Trina and Melissa provided a total of four instructors to rev up the people. ZumbaFunFit's Fall session opened with a fund-raiser to support cancer research. This party was on Wednesday January 2nd, 2013 at 7pm in the Carleton Place Arena upper hall. Instructors Louise, Trina and April wowed the crowd. The ZumbaFunFit team gave a Zumba® PARTY to support the relay for Lifers in the wee hours of Saturday morning June 8th from 12:30 AM to 1:30 AM. GEMMEL Park in Almonte was the site where April, Melissa and Louise gave a great performance to boost spirits. Fund Raiser for Lanark county Interval House for Women. Attending this great event were 45 people plus 4 instructors plus Tom to have exactly 50 that night. We raised 560 dollars thanks to extra tickets purchased. I added the proceeds of ongoing Zumba® clothes from the past year and topped it up with my donation to make an even ONE THOUSAND dollars for Womens Shelter. The lists of helpers for the night is too long to list here. Thanks to instructors April,Melissa and Trina you are the BEST. ZumbaFunFit had another fund-raiser to support cancer research to open the winter session. This party was on Wednesday January 2nd, 2013 at 7pm in the Carleton Place Arena upper hall. All our fabulous team of instructors are, again, donating their time! ZumbaFunFit fund-raiser to support cancer research was held Sept 5th, 2012 at the CP Arena. Many thanks to all who came and donated their time and toonies. This was a great way to show support and try out a class for free! Louise and instructors April, Lainie and Trina supported the relay by holding an hour long free class outdoors at the park for the participants. A great time was had by all - despite the biting bugs. ZumbaFunFit had another fund-raiser to support cancer research for the winter session. This party was on Wednesday January 4th, 2012 at 7pm in the Carleton Place Arena upper hall. There were fabulous guest instructors as well (Thanks to April, Megan, Indy and Lainie)! This was a FREE class - a Toonie for the research was suggested. Everyone who came and supported the cause - a big THANK YOU. For the first class of the Fall Session, 2011 ZumbaFunFit hosted a Zumba® party in aid of Cancer Research. This was also a FREE class held at the Carleton Place Arena Upper Hall on September 7th at 7pm. This event was packed! Thanks to all who came out for a fun night. The proceeds of Zumba® wear and Belly Dance scarves goes to LCIH. 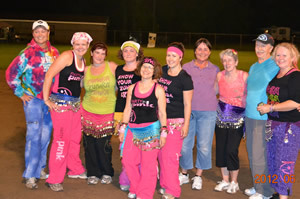 The Interval House Zumba® Fund Raiser Class held Oct. 20th, 2010 at the Carleton Place High School was a huge success. Over $1200 was raised from the attendees as well as from the sales of scarves and Zumba® wear. At the right is a photo of Trina (one of the local area instructors demonstrating) with Andrea (a ZumbaFunFit member) at her table admiring the silver jewelry. A big thank you to all those who helped set up, provide the nibbles and managed the admittance at the door.